I dreamt about piping competitions last night. I'm probably a little anxious about coordinating the piping competition at the Loch Lomond Games one week from today. We had more competitors sign up than we could handle, so unfortunately we had to turn a few away. Nice position to be in from a games' standpoint, but I hate telling people "no". I still can't sleep on my right side or raise my right arm to full extension over my head without an uncomfortable amount of pain. Vicodin ran out weeks ago, so I've been alternating Tylenol or Motrin as needed. I've been trying to go without most of the time, it can't be good to take those continuously. Recuperation is very slow. Band practice was a full three hours in anticipation of the demands of the games and my shoulder was in pain by the end and the next morning I woke up more sore than normal—or at least 'normal' for lately! I've decided to play Siege of Delhi for my 2/4 March. I think that will help my performance. I told Jay Salter, my instructor, of my decision a few days ago and he said that he thought that it was wise and that he was about to recommend that anyway. There's always a certain amount of risk in changing a competition tune mid-season, but I don't think I can get where I want to go with Balmoral Highlanders right now. I haven't had time to write anything since I've been so busy getting this competition ready. It's cost me a bit of practice time too, unfortunately, but that's expected. I have spent more time with a metronome in the last few weeks than all of last year combined. I need to continue that more. I was at Highlands Park by about 8:30 a.m. It was cold enough to see your breath about a foot in front of your face. I dropped off the kilt numbers and final will-call pipers list at the entry booth. Long-time Santa Cruz Pipes & Drums bandmate Michael Haughey and his mother Deborah (a.k.a. band "den mother") had already arrived with the band tent but were debating the proper location. 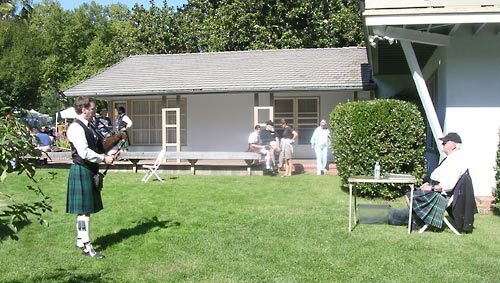 The traditional spot had a gas driven electrical generator nearby and it would be running all day long—forget that! The judge, Jimmy McColl arrived early. 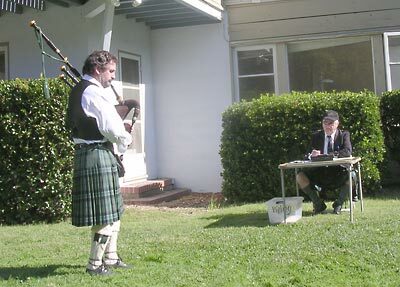 Also early were Frank Conley and his fellow Monterey Bay Scottish Bagpipes Research Group pipers—though no Kip Morais, who was playing in a water polo match. I quickly said hello to Chuck Jamison, a former WUSPBA steward, who was also in town for the games. Today, Michael would act as the steward until band duties called him away, then Deborah would take over. Jay appeared and selected a spot for the tent near the gate booths. I loaned an extra vest (from a Prince Charlie jacket set I bought used this year) to Chloë a tenor drummer who had just joined the band. Around 9:30, I warmed up my pipes a little bit and things seemed to be working pretty well. The clouds were breaking up, it would be a sunny day later. Frank Conley playing his Slow March for Jimmy McColl early in the competition. A companion looks on near the table. 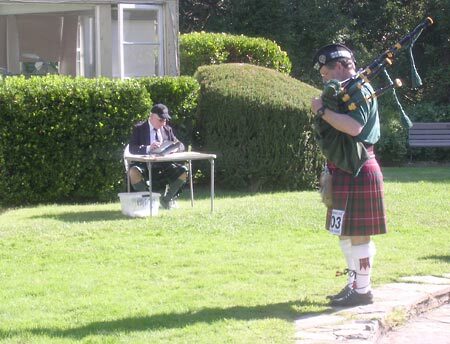 In the foreground, from the left, Michael Haughey with his steward's clipboard, Eric Magnus in his first competition and Mick Bench with his pipes. I checked in on the first competition event, the Slow March, to make sure everything was running smoothly. I was told there were some score sheets not made up for certain pipers, so odd. (Later I figured out that I must have, in my haste the night before, attached the Slow March summary sheet to the stack of 2/4 March sheets! So all the sheets were labeled backward for the two events. Gag.) I was scheduled to play at 11:15 a.m.
Mick Bench—"in the zone"—awaits for permission to approach the judge. Jimmy McColl checks his schedule under his clipboard for the next piper. At about 10:40 I played my pipes again. Oh no! The chanter reed was making a honking noise when changing from the high hand down to Low-G! The last month or so with less playing, I'd been leaving the chanter attached to the bag to keep it a bit more moist instead of removing it and putting it into my Kinnaird Piper's Pal chanter cap. Now, I was kicking myself. I'd ramped up my playing—not wildly—but enough to result in this! I squeezed the sides of a reed and tried it. Still problems. I removed the chanter and exposed the reed to direct sunlight, I might have enough time to get this thing dried out a bit. I had put a reeded chanter (my new Colin Kyo) in my pipe case last night, but the reed wasn't broken in yet. This possibility had crossed my mind last night—I'm a planner by nature. I was shaking my head. I should have learned my lesson from my first competition and had a second chanter and/or reed 100% ready to go. But, lately, I haven't exactly had lots of extra time (or a healthy body) to spend breaking in a reed I probably wouldn't need! Sigh. Paul Llewellyn on his way to a 4th place Slow March finish. James Tanner took this photo. If you look closely, you'll see my chanter reed airing out at the end of the chanter in my left hand. 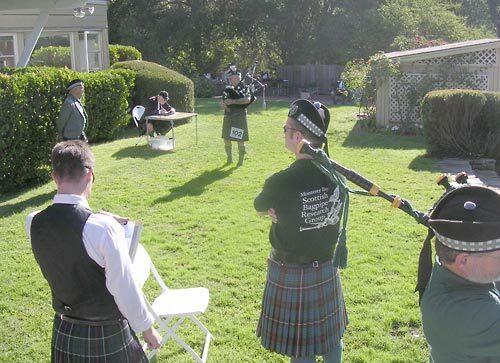 As my competition time approached, I went back to a secluded location and tried the chanter again. Holy cow! I'd overdone it. The pitch on the chanter reed was off the map! It was really high. I had to tune down the drones but the chanter was way out of balance. Ok. Think. Cold water bottle? No, too moist. I spotted some rocks in the shade. Ah, ha. I held the chanter reed against the rock for a minute and switched chanter reed faces. Then tossed that rock aside for another and repeated the process. Then I tried it again. Much better, but still a bit high and out of balance. Someone was calling. Michael Haughey, clipboard in tow, a smile on his face was berating me for being late to my own competition. Jay also appeared. He reminded me that as the last piper, to take my time tuning as the pitch was changing. I should probably note here that my recovery from my early-August shoulder injury has been very slow but gradually progressing. At least I can reach over to tune my own drones now—it is tolerably painful. Topping off the drones still hurts a lot, but I can tip the drones around across behind my head and stop the bass drone by reaching out and up with my right hand versus reaching across my body. If you are curious how I ended up on dirt-bike, you can read about my nephew Peter Lenz, he has his own motorcycle racer web site. Pretty fancy for a 9-year-old! Once at the competition area, I told Jimmy McColl my tune then turned and launched into retuning. I tuned the outside drone and retaped High-A which sounded out. I played a bit and retuned the drones and the chanter shifted again. (I couldn't help but think of Eric Mrozek and his entire chanter retaping job at Pleasanton a few years back!) I retaped High-A again, this time things were locking in. Darn, if it didn't sound pretty decent. I turned to face the judging table and started the tune. Playing Braes of Lochiel while Jimmy McColl listens on. In background, Jay talks with a former student Morgan Taylor. Young Prince Charles Pipe Band piper Lane Olson sits listening with a friend and her mother Missy. Betty, Jimmy's wife, steps down to the grass. While playing the tune, the funky noise for the high-G to low-G transitions had reappeared. Drat. At least they weren't honking quite so long and there weren't all that many in the tune. I played the tune correctly, and while the expression may have been ok, I wasn't really "in" the tune like I'd been at Pleasanton. All the chaos with the reed had made it hard for me to relax and I didn't feel like I was really letting the music sing. Nonetheless, it was a decent blue-collar "get it done" performance. There wasn't all that much time to dwell on it, the band's first performance was at noon and we had to start tuning. We got ready and a little after twelve, we were given the go-ahead to lead the parade of the clans around the grounds and past the main stage. By this time it was sunny and warm enough to start sweating. One-time fencer James Tanner with one of his favorite hobbies—swords! James participated in the parade of the clans. The next event was the 2/4 March. I had scheduled the band players to compete after the band's noon performance was complete. My time to play was 12:50 and, truth be told, I don't have the foggiest idea what the actual time ended up being. I had intentionally scheduled Paul Llewellyn between George McKay and me since George and I were competing with the same tune. But as it was, George wasn't ready, so Paul went ahead and we ended up playing sequentially anyway. I was stopped by a few pipers asking when the score sheets would be ready. I told them to find me around 1:30 after the next band performance. When it was time, I gave Mr. McColl my tune and once ready, played Siege of Delhi. Everything was going pretty well . . . first part . . . repeat . . . second part . . . repeat . . . third part . . . disaster! Somehow, I lost my transition from the 2nd bar to the 3rd bar! I went back to the pick up note and tried again—no go. Another attempt—failure. At this point, for the first time, I was seriously ready to give up and just break down. I made a conscious decision: "No, I'm going to finish this tune." On the third or fourth attempt, it "took" and I finished the part. I moved into the fourth part, but I was no longer holding the low-A notes that (more or less) start each line. I could tell that as I played. Ah, well. I was really hoping for a good gauge on my 2/4 march at this competition. But again, no time to dwell on it, the next band performance was looming at 1:15 and we needed to retune again. Once performing, the band was sounding quite good. I was starting to get fatigued and was sweating a bit. (I don't sweat very easily.) I'm glad we didn't play much longer than we did! My piobaireachd time was 2:37, so there was some time to get some things done. With some help with Deborah, I separated the score sheets and delivered them to the pipers nearby. Apparently Jimmy McColl didn't put too much weight into the reed's odd transition problems. I'll definitely take a second place. Pretty neat was first time adult competitor Eric Wampler taking first place—lucky dog! No placing. No surprise there. The clipped low-A notes were definitely there, particularly in the last part. No gripes on my part. Once the sheets were distributed to the immediate pipers, I asked Nancy Fredrick (back in town from Washington State for a few weeks and performing with the band) to help with any score sheet requests—I had to get a bite to eat! Being the Piping Co-Chair, I had a pass to the VIP food spread—though I have a pang of regret . . . no fish and chips! I was able to keep an eye on the competition area out the window. At one moment, Jimmy McColl had broken out his pipes and was playing Banjo Breakdown for Frank Conley and company. While Jimmy McColl is 78 years old, he can still play circles around younger pipers—I'd trade finger skills in a heartbeat! A number of pipers had dropped out of the games for a variety of reasons and we went from what I thought was going to be nine piobaireachd pipers down to five. Paul decided to scratch and that made it just four pipers: George MacKay, Daryl Turner, Laurel Stern and me. Mike Lindelsee—who had dropped out a few days earlier due to a bad cold—asked how things were going. I told him that I couldn't even stay focused enough today to sing the canntaireachd to myself and since I've been spending my time preparing score sheets and schedules that I hadn't had much time to spend on my own practice! George was having trouble with his chanter reed too, but even more than mine. I opted to play ahead of him to allow Jay time to try and get things working. I went to give Jimmy McColl my tune and . . . I forgot the title. Hmmmm. Duh. "Battle of Auldearn, number one." The drones sounded pretty good from Jay's tuning a few minutes earlier, I didn't feel any need to change them. I started into the tune and again, it wasn't like Pleasanton where I could just focus on my own solo piping—no organizing, no band, no funky reed, etc. I think I've played Auldearn so many times now, I could play it in my sleep. I played the tune solidly, though I wasn't feeling that 'flowing with the music' as much. I also had some saliva building up during the variation—I'd just eaten lunch—I was concerned, but I held on. Once I was done, Jay asked me how I thought it went. I told him I would have changed the timing a bit on High-A notes in the first variation. It was such a whirlwind day that I didn't have the luxury of taking to "center" myself. Games: Loch Lomond, Date: 10/7/06, Event: 403 Piob. Drones went out a little. 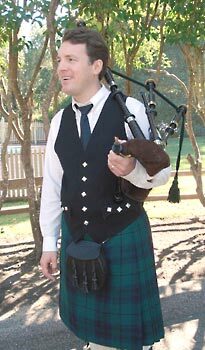 I was happy of course with a first place, but it would have been sweeter with more pipers—or if I had felt that I'd played my best. The band performed again around 3:45 then again for the closing ceremonies at 5:30 with the sun setting behind the trees. The crowd had diminished by that time. Once done we headed back to the band tent, I stowed my pipes and collected my vest from Chloë. Pipers were slightly slow to leave, it had been a long day—feet hurt, energy was gone and there was a certain amount of "detox" knowing we were through. I was home about 6:30 p.m. and Charlotte was waiting: "Any medals, Daddy?" "Two, Charlotte." Now, the question question is, with an inconsistent 2/4 March, will it be wise to move up to Grade III? Scary thought. While we didn't officially announce an aggregate winner, it was me with a 1st and a 2nd. Prior to running out of time, I was planning on making up a certificate before the games to hand out—but now, there's not much point of making one for myself! Well, no more competitions for this year. Time to prepare for next year. My biggest worry for a full piobaireachd is crunluaths. I broke my left ring finger a few years ago and it gets very fatigued with lots of repetitive movments—such as required for a crunluath variation and the crunluath a mach variation. That and concerns of drooling. I'm not worried about expression, staying focused, or tuning. I'll expect some drone drift, but I can work up to that with time. Time will tell! In any case, it'll mean moving to the bottom of that grade's food chain and be out of the medals for a few years . . . hopefully, I won't end up embarrassing myself!